Brad Pitt and Matthew McConaughey may have been separated by a busy street, but they still found a way to share the party. 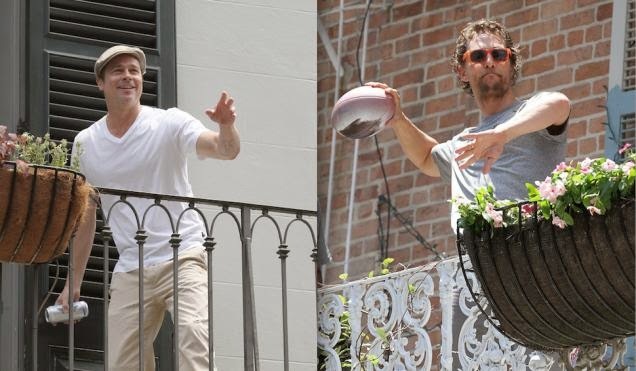 The actors crossed paths this weekend in New Orleans when McConaughey flew in to film an Amazing Race scavenger hunt segment on a balcony with Saints quarterback Drew Brees. Eventually Pitt, who happened to own the house across the street from where McConaughey was filming, wandered out and started waving. When McConaughey finally noticed him, Pitt—who's been rumored to be in talks for the second season of True Detective—managed to toss McConaughey a beer from his balcony. Not pictured: Woody Harrelson, sulking. Labels: #Alcohol, #Beer, #BradPitt, #Matthew McConaughey, #New Orleans.